Enjoy this a beautiful blog from working student Anna. For the past several weeks I’ve been getting to know Elena. She’s a very friendly horse and so she’s perfect to teach a beginner like myself! Mostly I’ve been learning how to interact with her, and simply walking her from one field to another is always a learning opportunity for me. With every lesson I notice her listening more to me with less resistance. I’m learning how to be a guide for her, stand firm when she tries to dominate me and lead her to some tasty mangos every now and then. I’m learning a lot and also having fun. It’s great to notice my own progress, see the things about horses that I’d never noticed before. I’m also feeling very comfortable around Stina’s herd, where I would usually be more afraid of those huge animals. Whether it’s Stina’s own meditative nature or something about the horses themselves – I always feel like they are incredibly gentle creatures. This came to be important last Sunday, when we took Magic, Moonlight and Elena for a walk around the school grounds. We went to get some mangos and breadfruits, we practiced walking in sync, stopping, walking again, with some grazing here and there. It was a very nice, sunny afternoon and we took a lot of pictures. I was already very happy with the lesson for having learned yet another way to make Elena listen to my commands when we got to our final destination – a field with a lot of tasty grass by the Hiking Centre. 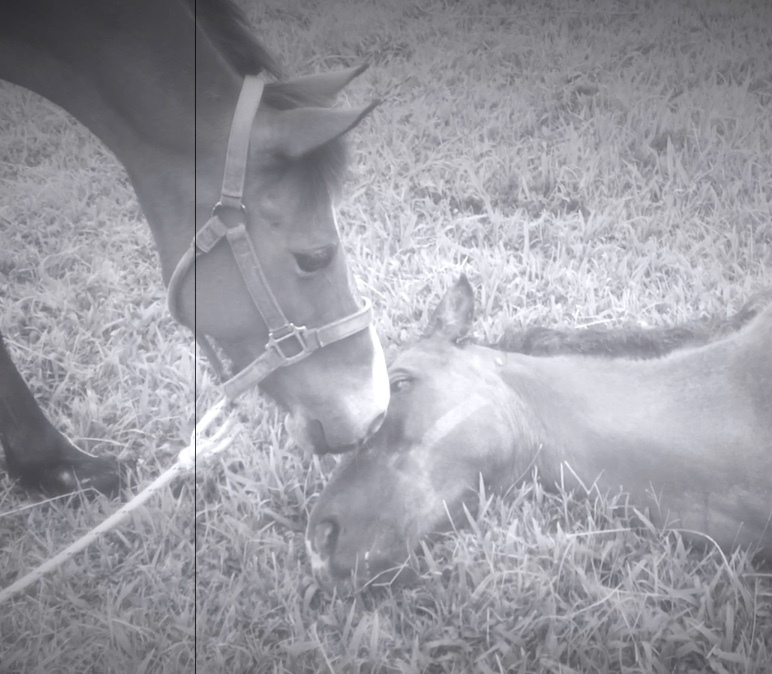 I was standing there with the horses and Stina went to close the gate when suddenly Magic started to lie down. At first I thought it was the nice shady space by the building but Stina explained that it looked like she was having minor digesting problems. It wasn’t anything serious (she’s back to usual by now) but the unusual part was that Magic trusted me enough to lie down in front of me. I crouched down a bit in order not to loom over her in such a vulnerable state. Later, Stina encouraged me to lie next to her. It was a very exciting experience, to lie so close to such a powerful animal, but I wasn’t feeling uncomfortable even for a second. We kept each other company in this way for quite some time, contemplating a beautiful Caribbean sunset together. It was a completely new experience for me. Magic’s trust was very humbling and my own reactions were a little surprise as well. I felt like my instincts sharpened and I instinctively knew what to do and what not to do. I could understand when she’d subtly „tell” me to back off a little bit and when she’d relaxed again. It was like something changed in me and I felt that all of my previous lessons with Stina and the horses enabled me to experience this amazing moment – however insignificant it might have looked from the outside. To enter the world of horses we need to be aware. 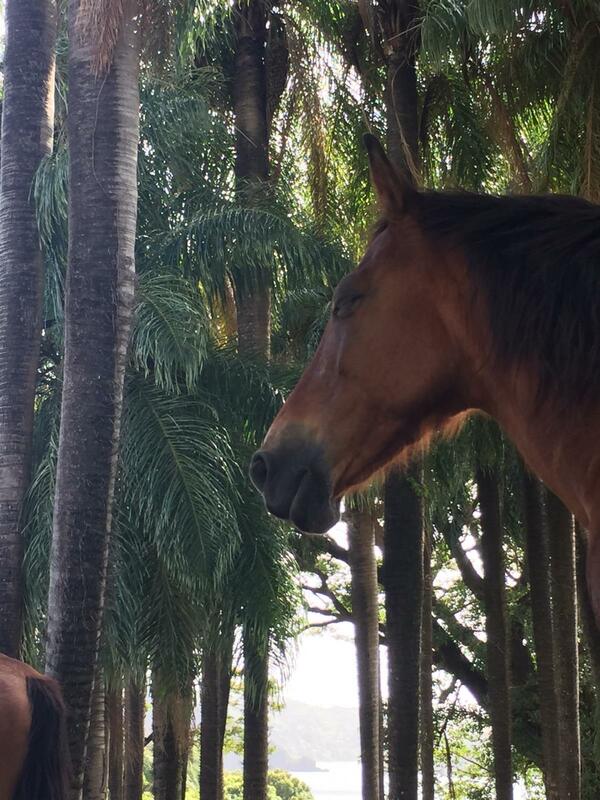 Thinking all the time about the future and the past is not a part of a horse’s world. We’re often jumping between future and past. One thought after the other rise. In between there is the present. The past is finished and the future does not exist. What exists is the present. Horses live in the present. When you are present you become aware. This is the first state of awareness to create the trust and the bond. In this state you become peaceful within yourself. The peace is so great that you enjoy your peaceful existence. Horses are attracted by people in this state of being. as you become a source of peace.